The path beyond the summit of High Raise turns to the right here before a steep drop into Ramps Gill. 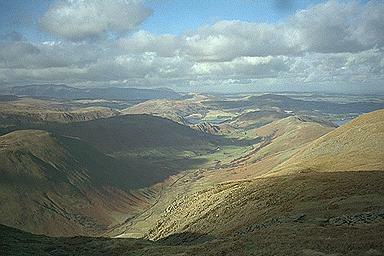 Red Crag is seen on the right with Gowk Hill leading to Steel Knotts and Hallin Fell to the right of centre. Ullswater is seen either side. On the left lies The Nab with Beda Fell beyond and Beda Head entirely in the shadow of the cloud. Further beyond on the left is Place Fell and Blencathra is on the horizon.